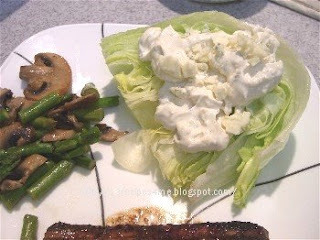 I've tried making this with several different types of blue cheese dressing. I have liked them all, but this last one I tried my husband liked the best. Place dressing ingredients, except the cheese, into a container. Mix very well. Best if made a day ahead. Rinse head of lettuce. Hit the stem firmly onto the table or counter to remove. Wrap it in paper towels, stem side down to dry. Place back in refrigerator with dry paper towels (I put it all into a plastic bag to keep it crisp,) until ready to use. Do this step when you make the dressing.